Melatonin naturally regulates a person’s sleep-wake cycle. When sleep patterns are disturbed falling and staying asleep can be difficult. 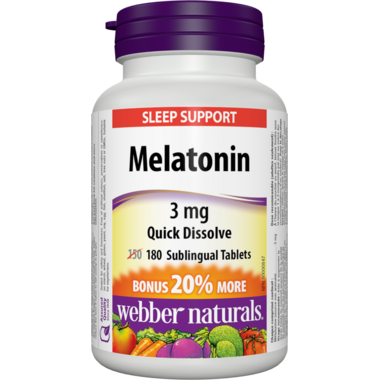 Supplemental sublingual Melatonin, Easy Dissolve, 3 mg from webber naturals helps reset circadian rhythms and improve sleep quality, especially related to aging, sleep disorders, and jet lag. I use to take this years ago to help with sleep when I worked shift work, this time it's used to counteract my systems disorientation after the time change and my minds working overtime thinking about all the things I need to do. Usually, as soon as I go to bed my "monkey" brain starts chattering but if I take this before going to bed I quietly get to sleep in no time! no lingering affects in the morning, and fast acting. excellent! My 12 year old son takes this at bedtime to help quiet his mind so he can get to sleep. Seems to do the trick. We like this brand. Helps to get a good nights sleep - I take about an hour before going to bed 3 mg is about right dose for me. a great product that our family uses that doesn't interfere with existing meds!